Learn about the temperament and personality of the Toy Fox Terrier. Discover what he's like to live with, his traits and characteristics and how he generally behaves. And look at lots of Toy Fox Terrier photos. The Toy Fox Terrier has the brains and devotion of a toy breed but is also a true working terrier. It's a firecracker combo: courageous, outgoing, friendly, funny, entertaining, alert, spirited, determined, fearless, and fiercely loyal to his family. His intelligence is legendary. 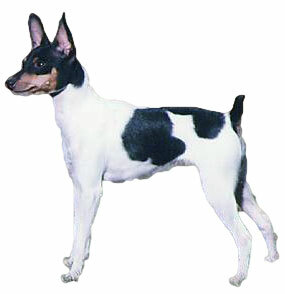 The Toy Fox Terrier is adaptable and can live anywhere, in a tiny apartment or on a farm. He loves to play outside and has unending energy and zeal for play. He will want to spend every moment with you. He can anticipate your thoughts, and seems to understand what you say. He will even try to speak to you, and will expect you to understand what he means. Many Toy Fox Terrier owners have resorted to spelling out words like, "car," "walk," and "ice cream." He is an excellent watchdog and has a fierce bark to thwart intruders. Yet, they are usually not problem barkers. They love children, but because they are such a small and fragile breed, they are probably not safe in a home with toddlers unless interactions are supervised. They do well with other dogs and most do well with cats. They are quick to housetrain, which is rare with toy breeds. This is a big dog in a small package: alert, sassy, and wired for action. If you want him cuddled up in your lap, he'll be there. If you want to go for a walk in the rain, he's your man. If you want him to make you laugh, he will do that too. He is a wonderful companion: loving, loyal, and lovable. The Toy Fox Terrier is intelligent and quite easy to train. He learns new commands quickly at an above average rate. The Toy Fox Terrier sheds a fair amount of hair. You'll find hair stuck to your couch, carpets, clothes and everything else in your home.